An article just published in Oceanography by PMEL’s Dr. Robert Embley and collaborators at Japan's JAMSTEC, Oregon State University (CIMRS), Washington University, and the University of Texas, Dallas describes the site of a 2010 submarine eruption of a 200 meter deep seamount in the Mariana arc that was powerful enough to produce an atmospheric plume. 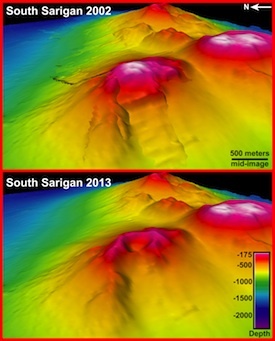 Comparisons of pre- (2002) and post- (2013) eruption bathymetric surveys reveal a new 400m diameter crater. This new map targeted dives with a JAMSTEC remotely operated vehicle in 2013. This new information will help evaluate the hazard potential of submarine eruptions. For more information please visit the PMEL Earth-Ocean Interactions website.